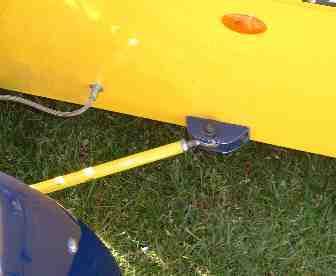 One of the common fixes carried out to the pre-2b type of Robin Hood, is to remove the Sierra anti-roll bar, and fit tie bars instead. This lets the suspension actually work, giving you a much improved ride. As this is part of the suspension, for manufacture of these parts, it is best left to those that know and understand what is the correct metal to use, as any old material will not do. These are straight tie bars that are the most 'common' found, but be aware of the tyre and cycle wing bracket possibly catching them on lock. Also with any tie bar, the car must be strengthened up inside to take the forces, do not just screw them to the side of the car!